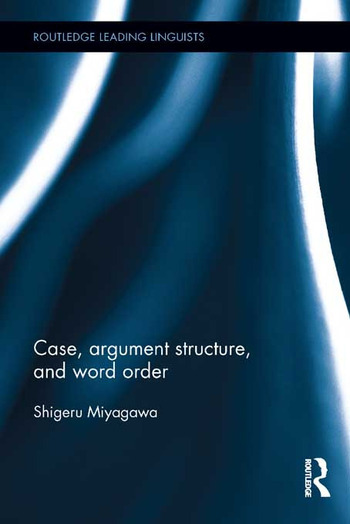 Over the years, a major strand of Miyagawa's research has been to study how syntax, case marking, and argument structure interact. In particular, Miyagawa's work addresses the nature of the relationship between syntax and argument structure, and how case marking and other phenomena help to elucidate this relationship. In this collection of new and revised pieces, Miyagawa expands and develops new analyses for numeral quantifier stranding, ditransitive constructions, nominative/genitive alternation, "syntactic" analysis of lexical and syntactic causatives, and historical change in the accusative case marking from Old Japanese to Modern Japanese. All of these analyses demonstrate an intimate relation among case marking, argument structure, and word order. Shigeru Miyagawa is Professor of Linguistics and Kochi-Manjiro Professor of Japanese Language and Culture, Head, Foreign Languaages and Literatures, MIT. He works on issues of syntax and morphology using a variety of languages including those in the Altaic family and particularly Japanese.